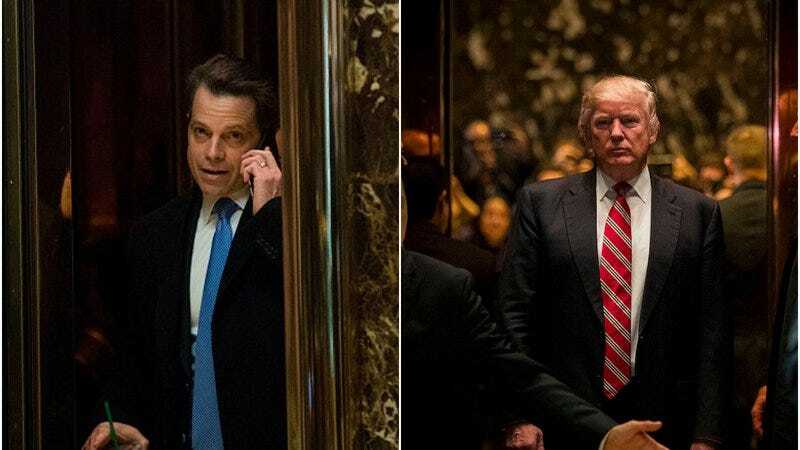 Yesterday, walking cartoon Anthony Scaramucci was fired from his position as President Donald Trump’s communications director, likely as a result of that comically profane New Yorker interview. He’ll be okay, though—he’s already lined up as an executive producer of a new HBO movie about pedophilia-enabler Joe Paterno. This isn’t his first dalliance with film, however; back in 2010, Scaramucci appeared as a short seller in Oliver Stone’s Wall Street: Money Never Sleeps. Still, at least he made the final cut of the movie. His old boss can’t say the same. Trump filmed a scene with Michael Douglas that was cut from the film but included on the DVD’s extras. Spoiler alert: Trump’s maybe never looked so dead-eyed. Though Stone says the Donald’s cameo was cut due to an “editing issue,” other sources say his diva-like behavior didn’t help. The preferred camera angle is Mr. Trump sitting front face to camera slightly favoring his right side, while avoiding left hair part and back and sides of hair and head. Camera eye level or above. If any angle shots need to be taken, please only use Mr. Trump’s 3/4 right side angle shot, while still avoiding the back and sides of hair/head. Lighting, warm golden lighting (no red tones please). Can you please include an eye light (if shooting in high definition, eye light needs to be even more powerful). Also, we had more success with being front lit and avoiding strong lighting behind top of hair/head). The result is golden blond hair, warm golden (even tone) tan skin and a more defined jaw-line. A great reference for Mr. Trump’s look is always the boardroom scenes in Celebrity Apprentice. Can you please provide a monitor for Mr. Trump to see the shot before he starts. If only he held his own media team to that same standard.